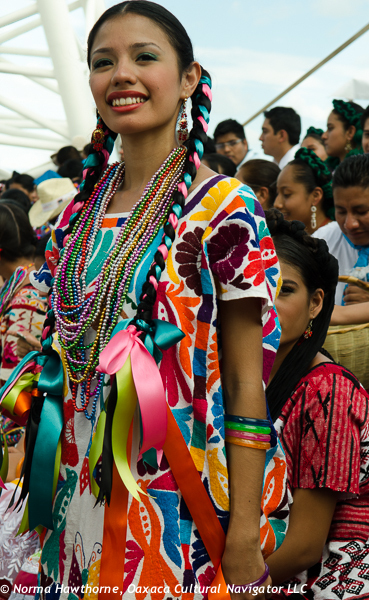 Oaxaca’s July Guelaguetza features some of the most glorious traje — indigenous dress — throughout the state. 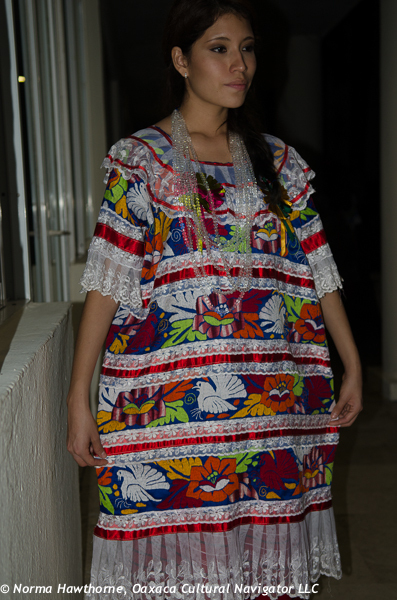 But few, if any, surpass the beauty from the state of Tuxtepec. 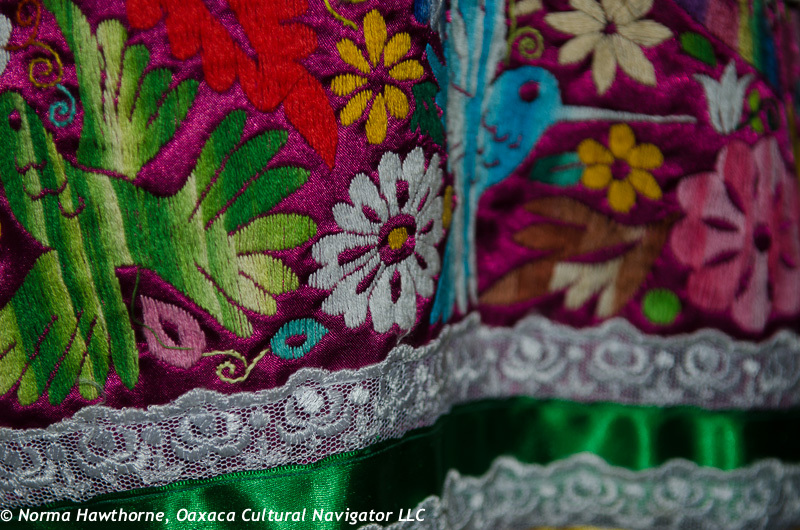 I am on a textile tour to discover the artistry of some of Oaxaca’s most remote villages. 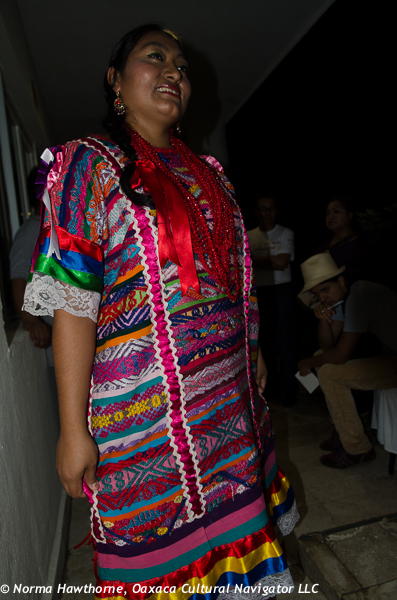 The evening our group arrives in Tuxtepec from Veracruz, we are treated to a fashion parade. 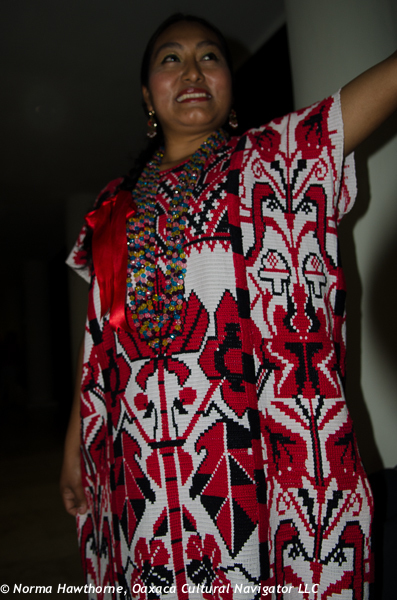 Featured are the region’s woven and embroidered garments that we will see over the next several days. It’s like attending a sneak preview! 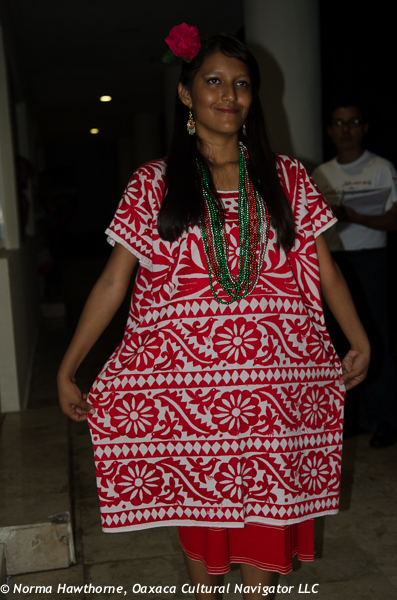 They varied from the more simple daily wear of traditional women to those that are more elaborate and reserved for special occasions. The presentation is organized by Jose de Jesus Hernandez, known as Chucho. 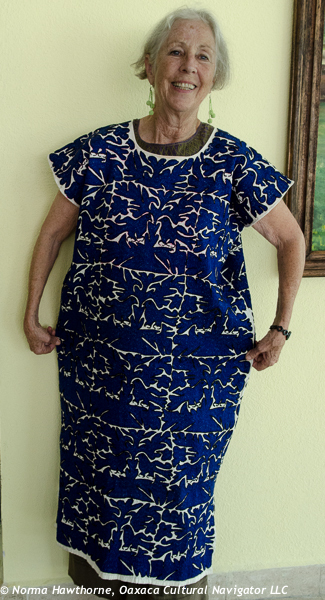 He teaches dance and has a collection of authentic dresses. Chucho explains that fifty-eight years ago there was a movement to return to the roots of the region by the younger generation. 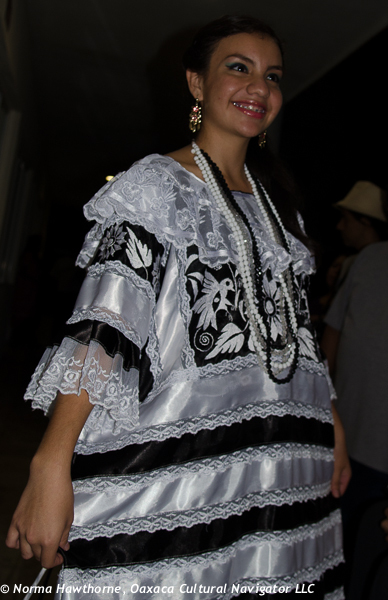 That’s why the Flor de Piña dance was created. 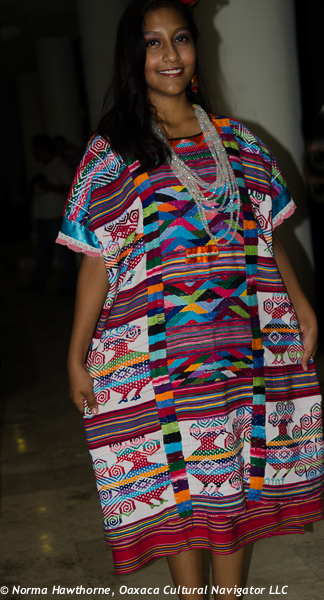 I realize that all the different huipil designs in this one dance at the Guelaguetza is a compilation to express the diverse weaving and embroidery styles of Mazateco and Chinanteco communities that are part of Tuxtepec. As our week together comes to a close, we return to Tuxtepec one last time. Dance master Hector Arturo Hernandez meets us at the hotel, teaches us the Flor de Piña dance steps and brings huipils from his collection to show and tell. I would say we were not equal to the task of keeping up with the strenuous foot work of the dance! 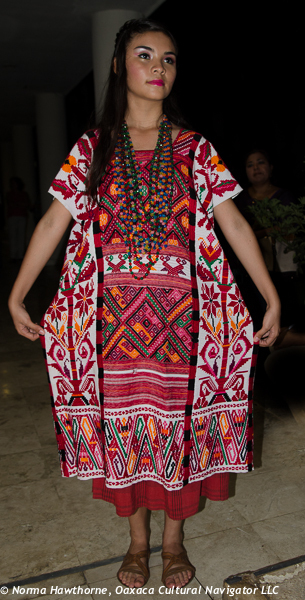 More than one hundred and eighty young women audition to represent these Chinanteco and Mazateco villages. 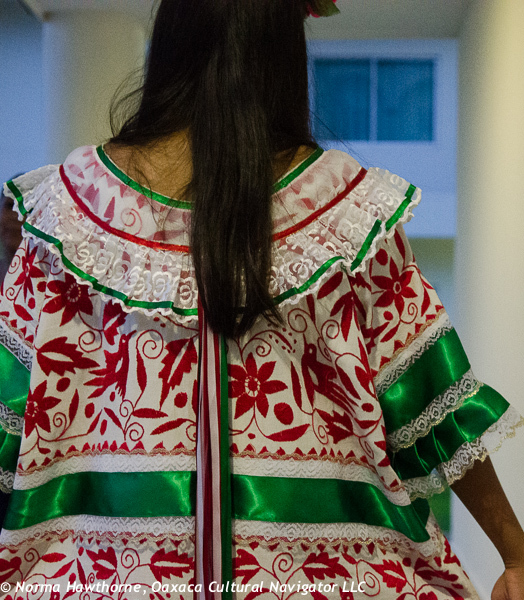 Only thirty-six are selected, says Don Hector Arturo, who has been teaching the Danza Flor de Piña for the past thirty-five years. 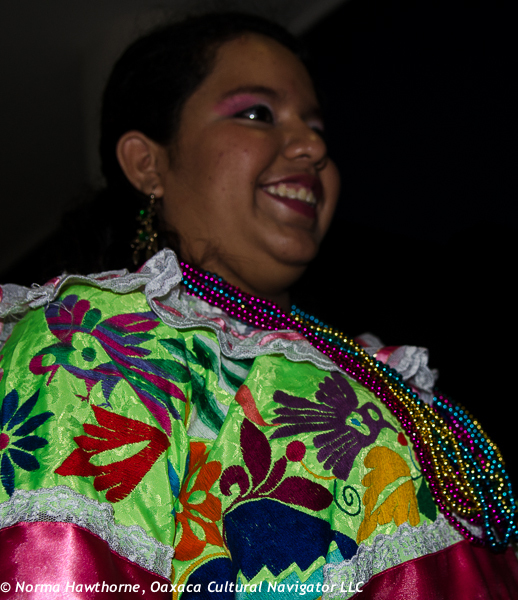 He recruits and selects the dancers, and serves as the narrative voice for the Tuxtepec delegation at the Guelaguetza. As soon as I hear him speak, I recognize him. 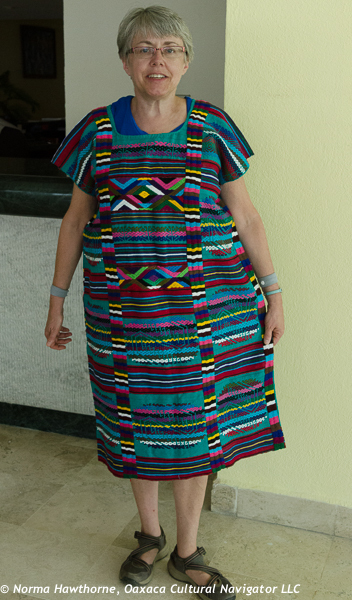 Our models for Don Arturo’s collection are women on the tour. 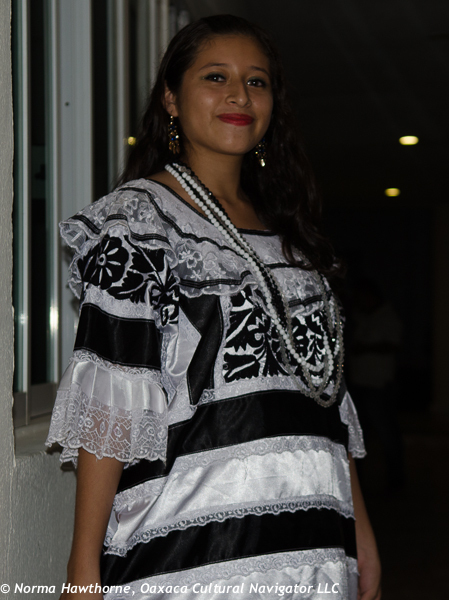 In 1958, the governor of Tuxtepec decided that the jarocho music and dance presentation at the Guelaguetza did not fully integrate Tuxtepec with Oaxaca, since jarocho is a part of Veracruz identity. 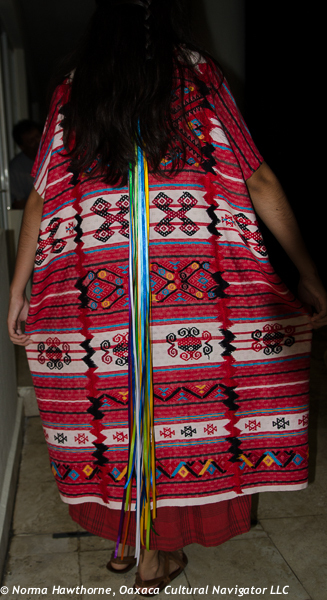 So, the Danza Flor de Piña was choreographed and orchestrated to the poem of native son Felipe Matias Velasco. 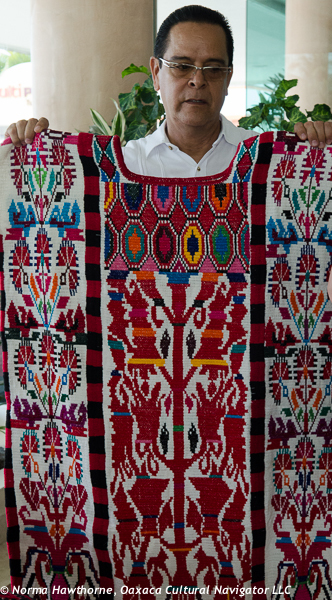 By doing this, the back strap loom weaving and embroidery of these remote Oaxaca villages became a distinguishing feature of the Guelaguetza, something that we all identify with its pageantry and with Oaxaca. 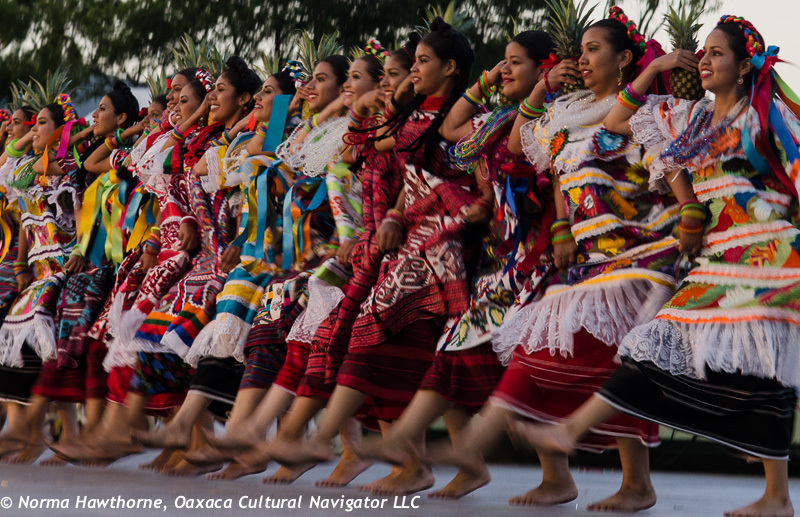 Those who study Oaxaca culture and communities know that the term guelaguetza is NOT about this annual tourist attraction that is a dance interpretation of the word. 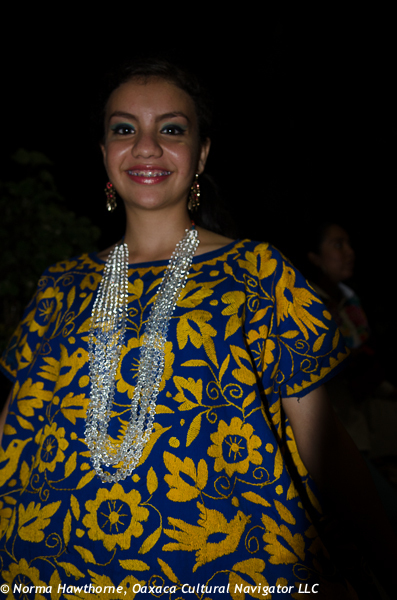 It is a way of life, the foundation for maintaining community and mutual support in indigenous pre-Hispanic Mexican villages. 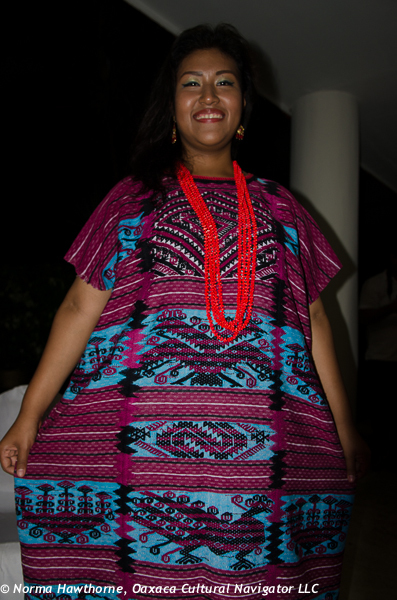 Note: These finest quality huipiles range in price from 1,500 pesos to over 6,500 pesos. 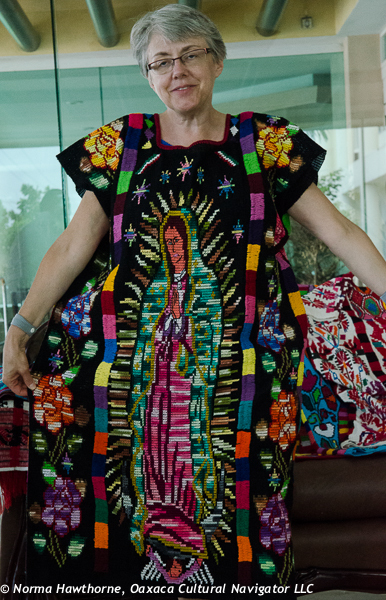 Some take more than three or four months to make. The current exchange rate is about 13 pesos to the dollar. 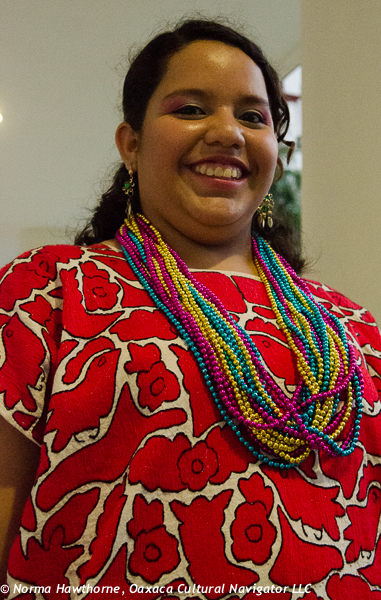 The average wage of an agricultural or hourly wage worker in Mexico is 100 pesos or eight dollars a day. 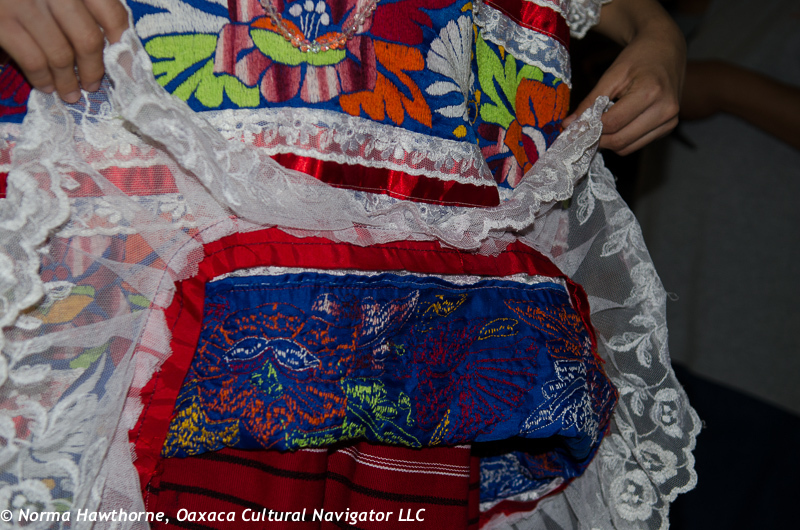 Tourism is Oaxaca’s economic engine. 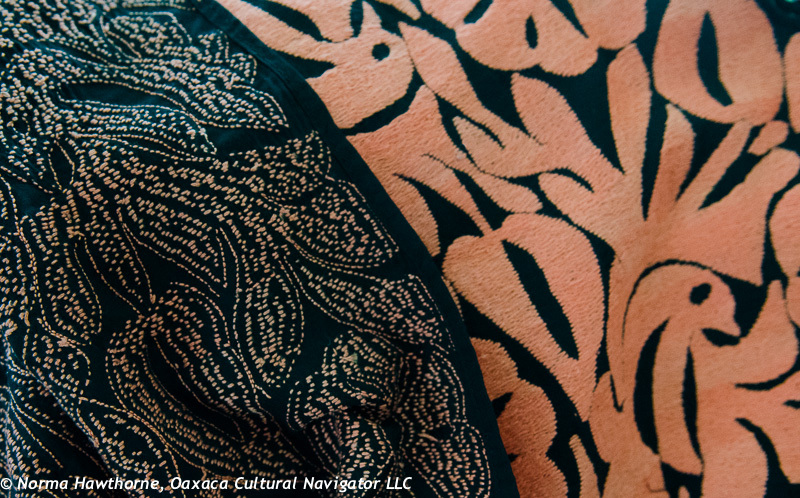 If you are more inclined to travel independently rather than taking a tour, take a bus or collectivo from town to town, or rent a car and drive from Oaxaca city on Mexico 175 to Tuxtepec. 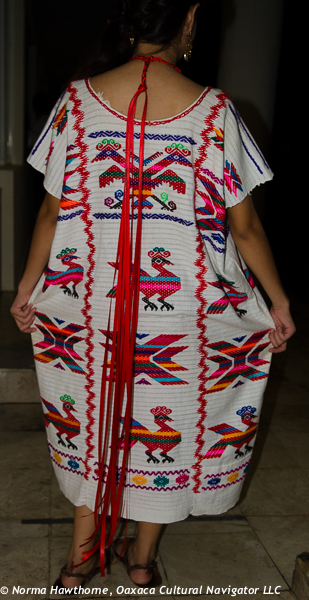 Get a Guia Roji Mapa 20 for the Estado de Oaxaca. You may want to stop and spend the night in Pueblo Magico Capulalpam de Mendez or continue on until you reach Valle Nacional. There are several lovely hotels in Capulalpam and a few small hostals in Valle Nacional. From there, you can get to the pueblos in the Papaloapan Region that we visited: Valle Nacional, Rancho Grande, San Pedro Soyaltepec and San Lucas Ojitlan, bypassing the entry through Veracruz. 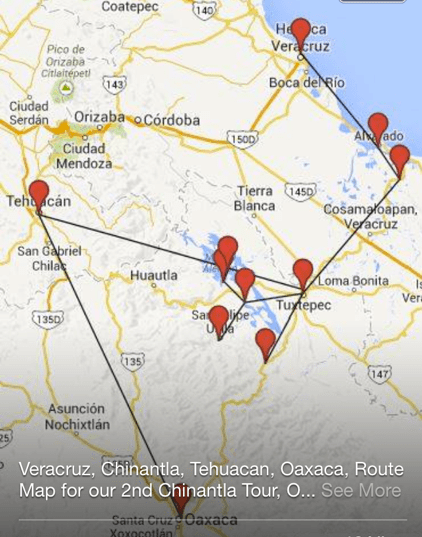 This route will take six to eight hours of driving from Oaxaca to Valle Nacional over winding mountain roads! You might also consider establishing a base in one of the villages if you don’t mind sleeping in a hammock or a basic, no frills room with only cold running water. 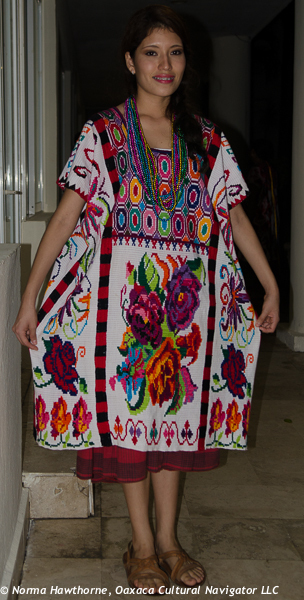 This entry was posted in Clothing Design, Cultural Commentary, Oaxaca Mexico art and culture, Photography, Textiles, Tapestries & Weaving, Travel & Tourism and tagged Chinateco, Danza de Flor de Pina, Embroidery, Flor de Piña dance, guelaguetza, huipil, indigenous dress, Mazateco, Oaxaca, pineapple flower dance, traje, Tuxtepec, weaving. Bookmark the permalink.